Sharp XE-A20S Electronic Cash Registers at Cash Register Store. 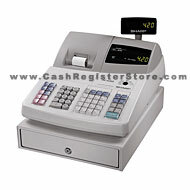 The Sharp XE-A20SR's are large retail buyback cash registers. We therefore list them as refurbished model cash registers. These cash registers include a NEW factory warranty. The Sharp XE-A20S is a powerful cash register with a low cost! Excelling features include 99 departments, 1200 PLU's, and 25 Clerks. An alpha-character thermal printer is standard with the Sharp XE-A20S. This machine keeps an electronic journal for end of day printing for all transactions. Another powerful tool the Sharp XE-A20S takes advantage of is its ability to interface with a PC for EASY programming and polling of reports. The FREE included programming software will definately speed up programming. The Sharp XE-A20S is the only cash register configured with a USB interface. No more woes with interfacing to laptops and dealing with serial drivers! This is our lowest cost and simplest cash register that will let you upload your end of day sales data to your PC for organized report viewing. This software is designed for ONLY ONE cash register and will NOT connect multiple cash registers for polling of reports. This programming software accelerates cash register setup to get you doing what you need to do...running your business. The Sharp XE-A20S replaces the Sharp XE-A202 model.